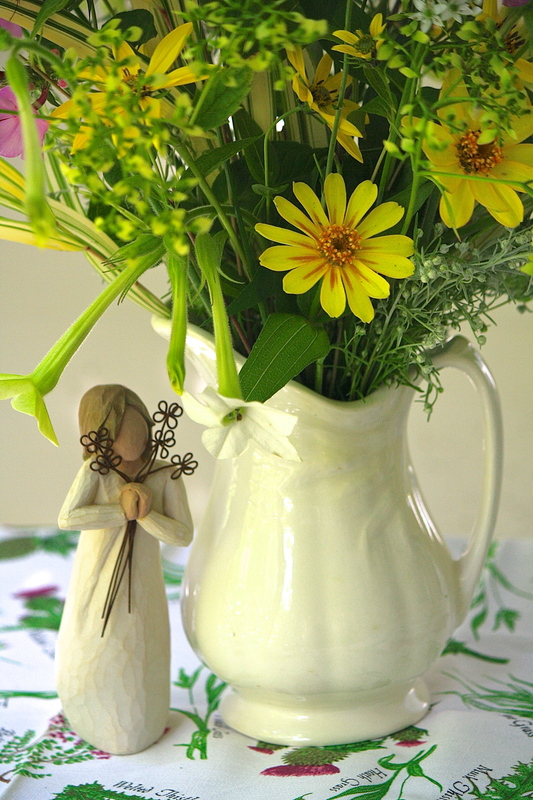 For this week’s vase, I’ve used bright yellow daisies of woodland sunflower (Helianthus divaricata) and zinnia (Z. ‘Profusion Yellow’). I think the ‘Profusion’ series is one of the best zinnia hybrids, a super performer that is drought and heat tolerant, as well as disease resistant. Even Japanese beetles seem to leave them alone. Coming in 15 varieties, they grow 12-15″ tall and spread to 24.” I put them in the garden next to the driveway, where it can get quite hot, but they don’t seem to mind it. If anything, they seem to thrive there. 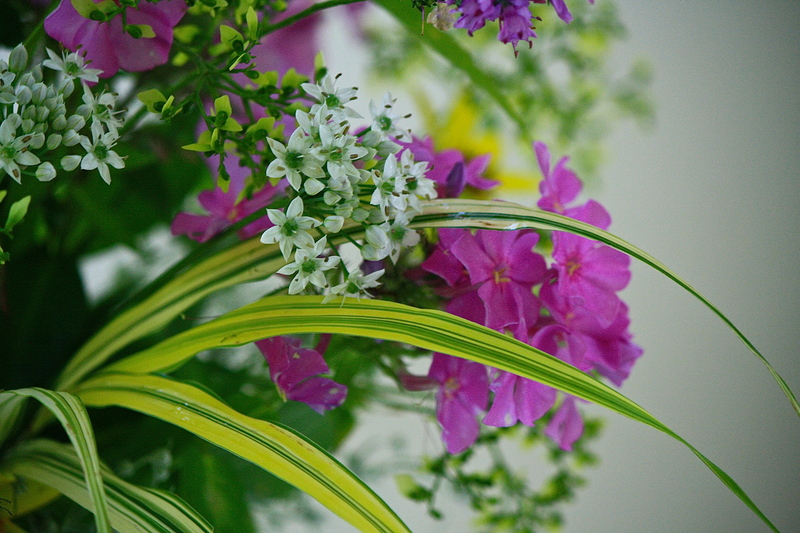 Continuing my vase description, hot-pink garden phlox (P. paniculata) and speedwell (Veronica spicata) provide additional pop to this eye-catching bouquet. Trumpets of white flowering tobacco (Nicotiana alata), clusters of garlic chive (Allium tuberosum) and tiny artemesia flowers (A. schmidtiana ‘Silver Mound’) attempt to neutralize the warmth. For filler, I’ve added winged seed heads of Yellow Lace (Patrinia gibbosa) and as an accent, I’ve used Japanese forest grass (Hakonechloa macra ‘Aureola’). The vase is a vintage English Ironstone pitcher, a family heirloom from my spouse’s mother and the Susan Lordi ‘Friendship’ statue was a gift from a friend. 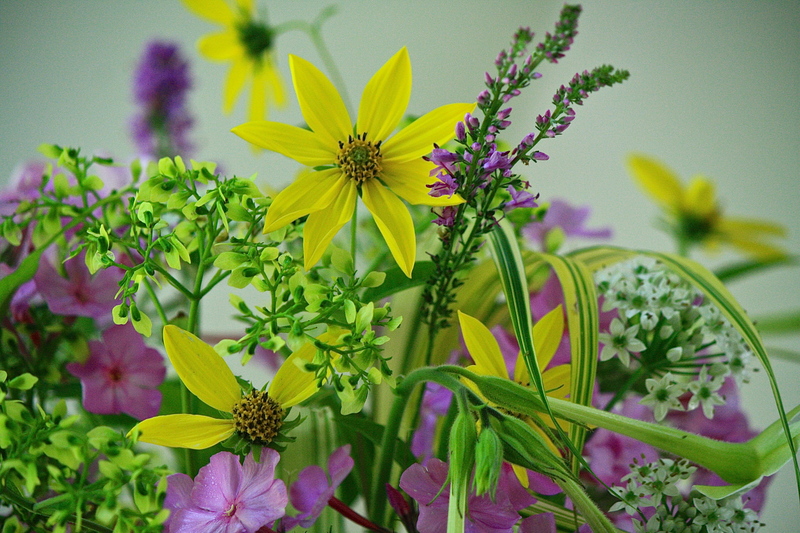 This entry was posted in Country Gardening, My Photos and tagged flower arrangement, flowers, garden phlox, gardening, gardens, garlic chives, hakonechloa 'Aureola', In a Vase on Monday, meme, patrinia, photography, summer, Weekly Vase Challenge, woodland sunflower, zinnia 'profusion'. Bookmark the permalink. Thank you, Trini. 🙂 Are you familiar with this line of angels? You’d love them, there are so many to collect! Thank you very much, Judy. Have a great week! A delicate capture of summers beauty! The color palette for the flowers is right. Here in Iowa, hikes along our trails treat us to abundant wildflowers of all kinds. Soon, they will be gone. Leaves are a bit less green and vital. The season progresses. It does progress…as I go kicking and screaming into fall. ;-D I miss the fresh smell of growing things in fall and winter. But I am getting more accepting as the years go by. Thanks for your visit, Jim! 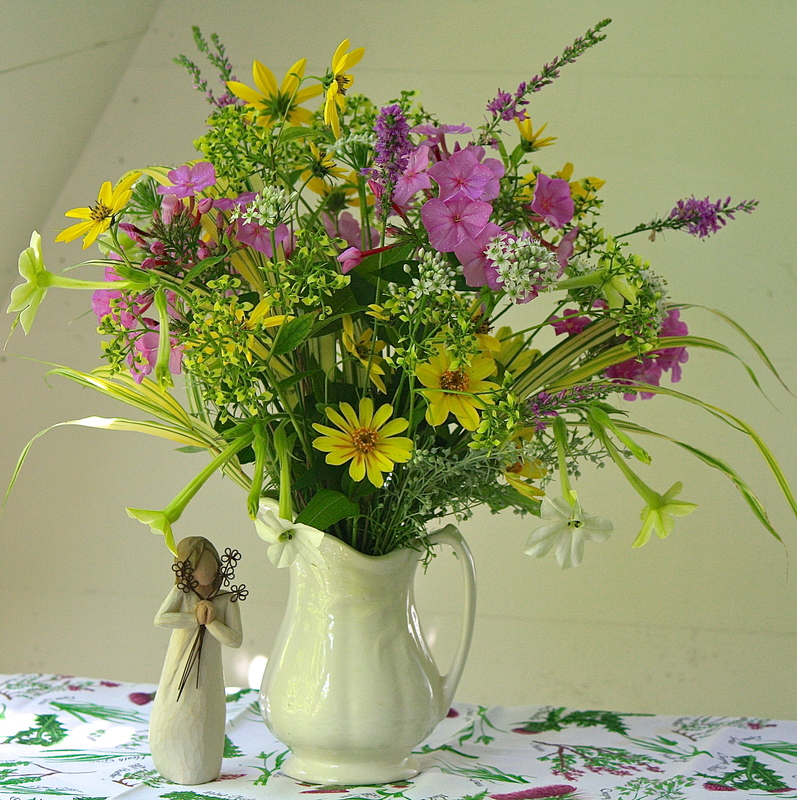 Eliza I adore this sunny vase with so many wonderful summer flowers to cheer….and the props are perfect! Your vase is gorgeous this week Eliza, just perfectly arranged and set. How do you keep your phlox blooming? Mine gave up long ago. Thank you so much! The bed doesn’t get sun until about 11:00, so that may be a factor, but being in western Mass., it is cooler here, so things take a bit longer. The deer sometimes browse the tips in spring, so that can set them back as well. I often have phlox through Sept.
Beautiful! Love the color combinations. Delightful, such dainty little blossoms! I really like this color combination. Purple and yellow help us focus and take note, I think. Thanks, Kim. I think this one might be my personal favorite so far, for the bright colors and daisies that are always cheerful! Your photos are always so clear, Eliza, and the vases just jump off the screen at you – so lovely. I have made a note of this type of zinnia to see if seed is available here as so far I have had little success with zinnias. 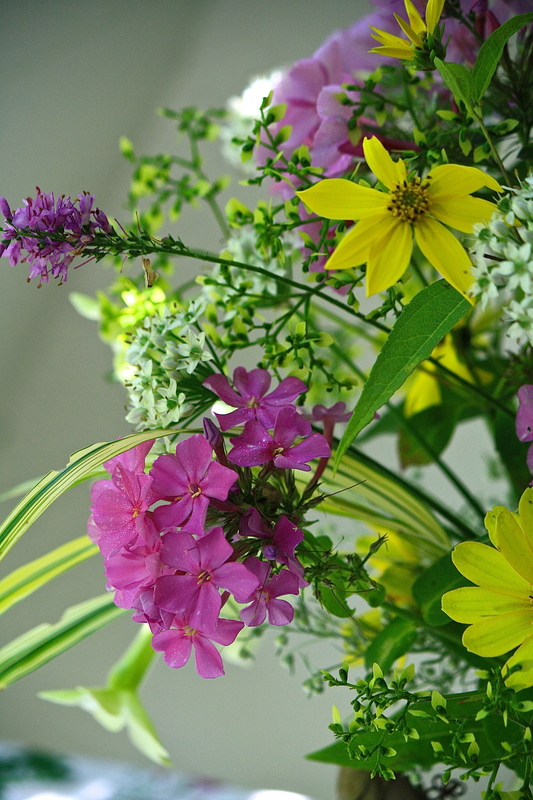 They look so good with the phlox and yet one mightn’t think of pairing yellow with pink but it works well. Thanks for sharing such splendour on Monday! Thank you, Cathy. Those zinnias are foolproof, if you can get them, I’m sure you will be pleased. Great picture, and some unusual flowers to us in the UK. I went oooo, and I thought immediately of Lemon Sherbet. Thank you, Noelle, it does look lemony, esp. the zinnia. I loved your little blue and white arrangement today in the pewter trio. It’s a lovely set and I’m glad you clarified about the pewter – my husband has tankards that I was afraid of using, which I guess are okay to use! Me, too! Thanks so much, Heather! Have a great week. I wish I could see all your creative arrangements in a lineup on a blog post. Each one is so beautiful and seeing them all together would be the ultimate joy. Now that’s what I call a beautiful vase of flowers Eliza. Absolutely stunning. You are talented! Thank you so much Gillian – you are sweet to say so! What a cheerful bouquet, Eliza! I smiled as soon as I opened your page and saw it. I’ve taken a note to try the Profusion series of Zinnias next year too. Thank you, Kris. I’m glad you liked it. I popped over to your site and must say I adore your arrangement of succulents! It is beautiful and to think you can root the cuttings later – no waste! Brilliant! 😀 Thank you for that lovely compliment! Beautiful colors and I like the pitcher for a vase. I’m going to be missing the fresh flowers in the late fall. Thank you – I miss my garden flowers, too. Frost will be here sooner than in your location. Thank goodness for store bought! Thanks, Maria. These are as close to ‘tropical’ colors as we get! Yes, you do get softer colors, how interesting! I must admit, I looked at your lovely ironstone pitcher first. I love the look – honest and sturdy. And of course, your arrangement is (again) quite beautiful. I don’t know how you manage to come up with a different look each time. I really like that yellow & green striped grass(?) too. Thank you, Micheal. Ah, the antiquers eye spots the ironstone! 😉 Fortunately, I have enough variety that I can attempt a different vase each week. There are overlaps of course, but I try to not repeat myself. Soon enough, there won’t be anything to work with. Sad, sad! I think I miss the freshly-made oxygen wafting through open windows the most when the cooler weather comes. The air quality here in summer is tip-top due to all our forests. It is such a blessing! Your summer air sounds like bliss. I can’t even say when (or if) I’ve spent month after month in fresh forest air. I envy you for that. Those weekends I spent working in Chicago in the winter with the windows shut — the stuffy air was worse than the cold. Just looking at this makes me very happy. Stunning. Thanks so much Sharon, glad that it does that! This is a beautiful combination and an amazing presentation.